Simple lettering on a plain bottle, leads to a humble beginning for a product that touts an accelerated healing time to second and third degree hemorrhoids. Their backing to this claim is their unique formula that contains a blend of multiple fiber rich herbs with a mild laxative for softer stools. If you take the time to look up their Amazon in product listing, you will bear witness to a claim that promises to permanently cure and treat the condition of piles (hemorrhoids). Surely a product that claims curative properties is rich in customer satisfaction and loyalty. After all, such a miracle cure is what we are looking for, no? There is no indication of how much of these herbs are in each pill. Hedonzal should never be taken in an empty stomach as it would not be effective against Piles. Pregnant women should always consult doctors before consuming the medicine and young kids should not be given Hedonzal at all. 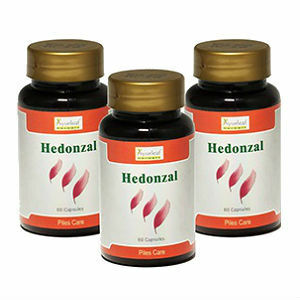 For three bottles of Hedonzal will cost you $29.85 which includes 60 capsules per bottle (180-capsules total). These pills can be purchased in even larger quantities of up to twelve bottles. Considering they are available in such high volumes and they appear to require a long term commitment, it seems that their curative claim might be more of a relief management that anything. There appears to be no money back guarantee of this product. If the product was available for a single bottle, perhaps the lower cost might be worth the gamble, but at 180 capsules for the smallest/cheapest batch of pills, it would seem they could back up their claims with some sort of a guarantee. From a collection of research, it suggests this is a newly launched product. The fact that there are zero customer claims to be found, good or bad, supports this. The fact that they are a newer product alone does not knock them out of the playing field, however the curious listing of their products does make one wary of the product they will be receiving. Will each bottle, or even each pill, be a constant new combination of herbs? Their claim of an “in-house” formula makes the whole thing suspicious. For anything you are expected to ingest, it is essential you have a complete list of ingredients and an idea of the side effects. The fact that this product may contain this or that is not sufficient enough information to make an informed decision. John Parker	reviewed Hedonzal	on September 3rd	 and gave it a rating of 2.